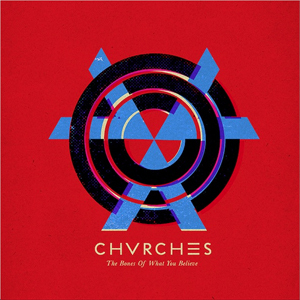 Chvrches – The Bones Of What You Believe | NoCoda. What It Sounds Like: Female fronted synthpop done right. Not overly complex or reaching, but sure of itself in every sense of the phrase. It’s been a while since you’ve heard a voice in the pop world sound so sweet as Lauren Mayberry. Her tone invokes innocence, but on the likes of standout tracks like Gun, even with its spacey “as bass heavy as you can get on a synthpop record” tone, there’s no mistaking her scorn for a lover that has done her wrong: Hide / Hide / I have burned your bridges / I will be a gun / And it’s you I’ll come for. Hard words from a woman that sounds like she’d rather kill a spider by sucking it up with the vacuum cleaner that squashing it underfoot. Either way, I’m not getting in the way any more after lines like that. Glasgow’s Chvrches (yes, with a “v”) formed in 2011 and began releasing music by 2012, and in 2013, they’ve become part of countless lists of “bands to watch”. But are they worth the hype? The Bones Of What You Believe, their debut, is worth the hype, as it brings accessibility to the front of the line. There’s no dabbling in overly experimental tones or time signatures. Just listen to their highest-charting single, The Mother We Share. You don’t get much more radio-friendly than that, and I, for one, am not complaining. I can’t make heads or tails of the lyrics, so your interpretation is welcomed, but as soon as Lauren flows into the chorus and starts her run of I’m in misery / where you can seem / as old as your omens – I’m all about the tone and the groove. It has every right to be a smash, because these guys can play both sides of the coin. While The Mother We Share is upbeat, even slower, more ambient (at times) tracks like Tether can hold their own with zero support structures. We Sink is a sure-fire single lying in wait that sounds like a backwards dedication of love (I’ll be a thorn in your side / Till you die / I’ll be a thorn in your side / For always / If we sink / We lift our love), while two of my others favorites that probably have a little less chance as single-releases (The killer icy synth notes on Under The Tide and the best under-the-radar chorus on the record of Night Sky) only round the record more fully. We aren’t without a few, quick missteps that must be mentioned. Science/Visions sounds like it should have been cut in half time-wise and used as a mid-record transition point, instead of burying it at track nine and hoping no one would notice. The album closes with You Caught The Light, a chill number that reaches for that quiet, grand moment in its five-minute-plus running time, but ends up never being fully born: it just floats in, says hello, wanders around your house for a while, and then quietly leaves out the back door. Even with those criticisms, I can’t find many more faults, except for the fact that overall, the lyrics aren’t anything to write home about, and as much of a lyrical person that I am, I feel like I’ve learned not to expect as much with synthpop – the highs usually aren’t hit. There will be good one-liners, but never great overarching themes. But even with that said, I’m letting the lyrics slide – here’s just too many good beats here to focus on. No major disappointments here. The Bones Of What You Believe is a solid first outing. However, their sound is generic enough that they probably have a larger-than-average chance of succumbing to the dreaded sophomore slump. Time will tell, but for now, there’s nothing but goodness abounding for Chvrches.